f she’s lucky enough to grow up at No. 15 Washington Terrace, a little girl with a romantic imagination can practice her wedding day from an early age, because the home’s magnificent grand staircase seems destined to have a satin train pouring over each step. Until the big day, a large second-floor gallery offers space for a tea party—or perhaps a little ballroom dance practice. When designer Carolyn Peterson first visited the house, the gallery was described as ‘the upstairs hall,’ but she knew the space was grand enough to stand on its own, and also deserving of a better name. “I really thought it was a perfect place for a homeowner to show off an art collection, and the natural light makes it a cozy spot to read or relax, too.” Spanning an entire wall at the top of the stairs, the gallery’s original mural makes the art-themed moniker even more appropriate. Peterson had the existing teal-colored carpeting removed from the stairs and the gallery to reveal the home’s original hardwood floors. “I had the option to paint the quarter-round trim, but it’s such beautiful wood, I left it natural. It’s a beautiful contrast between the light walls and the dark floor.” Walls are painted in a warm off-white, echoing the soft tones of the mural. 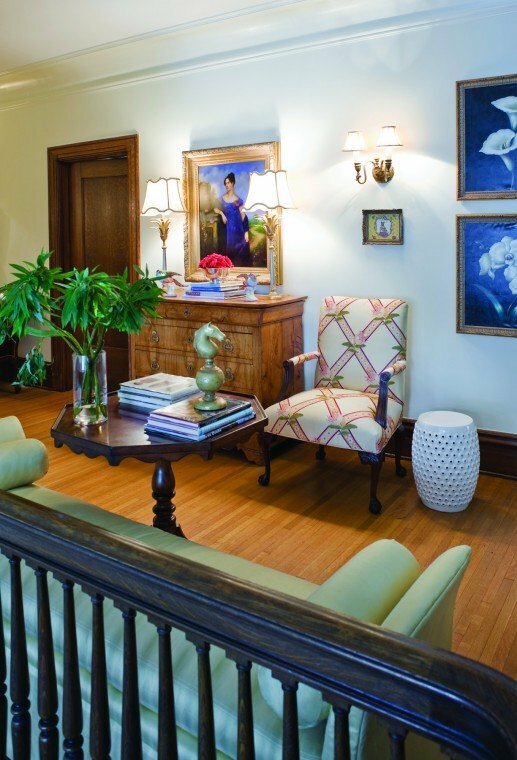 Antique chests from Clark Graves mix with newer pieces, artwork and books for a gallery worthy of the name.